Always be prepared to feed your hungry little one - even on the go! This set includes travel case and feeding spoon. Perfect for travel and diaper bag! I was worried before I purchased this that the metal base would make it too hard, but the silicon spoon head is gentle for baby's mouth. Great travel spoon! The case really comes in handy. Love this spoon and its case! so easy to travel with it. I love this travel spoon! 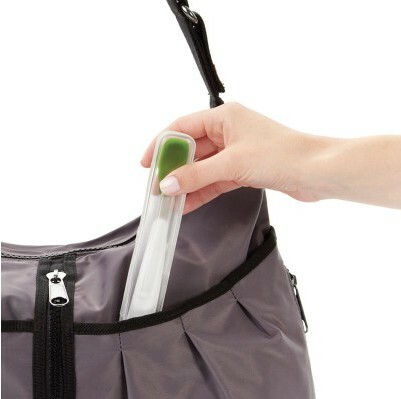 The case is really handy to have to throw the spoon in the diaper bag. The silicone is great for the baby's mouth and the handle is very comfortable to hold! Definitely my favorite baby spoon! 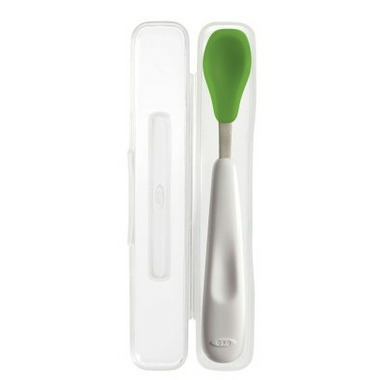 Not only do I love all the OXO products, but this spoon and spoon cover is great!! The rubber tip is perfect for babies with little growing teeth and easy on their gums. The spoon also takes a generous amount of food and its easy to manipulate. The cover is great in keeping the spoon free of germs before a feeding.